This instructables will show you how to convert a 1989 Toshiba T3200SX laptop into a modern day portable super desktop computer. The first thing you need to do is find a vintage laptop somewhere on eBay. I just so happen to have an old 1989 Toshiba T3200SX that I got from a friend. These are very good for this type of project because they have ton a space inside to put all your new hardware in. My friend purchases this vintage PC from Goodwill for about $20 but they can often go for about $200-$300 on eBay. Here is where you have to plan out everything in your head. It's always good to order extra stuff because you never know what you might need when you are building this machine. This project is not an exact science, its more like art. You have to be creative on the fly and move things around to make everything fit into this little case. The most important piece of this build is, of course, the motherboard. Your will need a micro motherboard, the smaller the better. I used a Foxconn H67S, these are discontinued now, but you can sometimes find them cheap on ebay or amazon for about $50. I used an Intel i5 processor (make sure to check Foxconn's website to see which processors are compatible), 16GB of RAM, and a standard 1TB seagate hard drive. I have a list of other misc parts you will need on the intro page. Now, you need to completely strip the T3200 laptop down to its bare bones. Everything most go! The only thing you want left is the outer case. Get rid of the motherboard, hard drive, power supply, plasma screen, and keyboard. I even suggest taking a dremel tool and cutting off all the tiny brass bolts that are embedded into the case. If you don't have a dremel tool, get one, it will be your best friend in this project. When removing the monitor, just get rid of the old plasma screen that was in it because you are going to upgrade it to a 15.4" Laptop LCD Screen. You need to play around to see where everything will fit. Lucky, I have done this for you all ready. In this picture, you can see the best layout in order to get everything in place. Now, its time to start mounting all the hardware to the case. The first thing you will want to do is mount the optical drive and then the motherboard. The next steps will explain this part. For my optical drive I used a Blu-ray slot type drive. I have it facing out the rear of the case and mounted it the case using hot glue and/or double sided 3M tape. Don't forget to hook up the cables to it because you will be mounting the motherboard right on top of it. Before we put the motherboard in, start installing all your cables. I used a 1 foot HDMI cable and mounted it beside the optical drive so I could have an output if needed in the future. Next, I ran the headphone and mic jacks out the right hand side. There were already holes there from old ports before that I used. After that, I used about 5 USB extension cables and ran them horizontal through the mouth of the old 3.5" floppy drive, the I used the floppy drives eject button as the new power switch, and then I removed the old floppy drive LED light and pushed the reset button out though the light hole (I know, super creative, right). I used lots of hot glue to hold it all together. I used a 1 foot Ethernet cable and ran it out to the left side of the case where the old Ethernet jack used to be. Now, we need to mount the motherboard. The motherboard needs to get stacked right on top of the optical drive. Use Motherboard Standoffs to secure the board to the case. This will take a little bit of playing around with to get right. To ensure that the bottom of the motherboard never touches the metal case of the optical drive, I cut a piece of sheet metal the same size as the motherboard and sprayed it with rubber stray paint called PlastiDip. After that I drilled 4 holes in the 4 corners and screwed it into place. I put a motherboard standoff in between the board and plate as a spacer. Then those standoffs screwed into the standoffs attached to the case housing. You will most likely need to buy a lower profile heatsink for the processor because the one it comes with sits just a little too high to close the case once it's all done. The power supply that comes with this motherboard is large. So you will need to tear it completely down and get rid of its external plastic and internal coverings. Also, every inch counts inside this small case, which means once you have the power supply naked and secured using the motherboard standoffs inside the case, cut off the extra cord and only make it as long as you need it to be, and wire it back together with wire nuts and electrically tape. One thing I also did is removed the fan from the power supply because it is loud and is not necessary because you will have three to four 40mm fans mounted beside and above it on the case. The hard drive is easy, just 3M tape it or hot glue it to the case right in front of the motherboard. Now, it order to do this, you will either have to use a dremel tool to cut the front hole bigger or do what I did and had it water jetted. It comes out perfect. See picture above. The 15.4" LCD Screen will fit perfectly inside the case once you use your dremel tool to cut out all the extra plastic that gets in the way. Remember, this is an art... not a exact science. You'll have to think on your own for a lot of this project. After it fits inside, hot glue it into place. The two clips on the top will also need to trimmed and modified in order to fit correctly. There are two springs inside each clip, cut the spring in half and hot glue them right on top of the LCD screen so they doesn't fall out. After that, I put some blue LED light strips behind the screen so they glow out the rear vents. If you want to do this step, remember to take black electrical tape and completely cover the back of the LCD screen. The reason is because the blue light will glow right through the LCD screen if you don't. This next part is a little tricky. You can't exactly plug an LCD screen from a laptop into a desktop computer. It need power and a video cable. You will need to order a LCD Controller. There is a guy on eBay who sells these for about $35. They are awesome! I put the link below. With this controller you will need a power supply and a 1 foot VGA cable to power the screen and hook up the video feed to the motherboard. The LCD Controller will sit inside the main body on the case with the power supply for the screen (strip that power supply down too and get rid of its outer plastic case). You will have to run the cables up through the screen housing to connect everything. One note, the cable the gets plugged into the LCD that controls the video input might be slightly too short like it was in my case. So, what I did is cut each little wire within the cable and extended it about 4" using wires from an old Ethernet cable (see picture above). Once all the cable are hooked up inside the screen housing, tape it all down to the back of the LCD screen with black electrical tape. After that, if you want, you can run your Power, HDD, and Reset LED lights inside the screen housing too. The lights are all ready there from the old computer. You can either tap into the old ones or replace them with new LEDs. After you get them in place, you can run them out the bottom of the screen housing along with the rest of the cables and plug them into the motherboard once it's mounted. Install 3-4 40mm fans inside the case. When it comes to fans, don't buy cheap ones from China, they are loud. You get what you pay for. I found that Staples.com has good quite ones. In the pictures you will see where I installed the speakers and fans. When it comes to the lights, just put them where ever they will fit. The light will find its way out. You should also mount a 3 plug surge protector (power strip) on to the top rear of the case to plug all your power supplies into. Solder to end of the surge protector on to the already existing outlet port embedded in the case. I used a pretty awesome touchpad on this machine. It has no buttons, and it is fully customizable. It cost about $60 and they are called "ergonomic touchpads". They are awesome! The only thing I didn't like about it was that it had its brand name printed on it touchpad skin. So, what I did is after I measured and cut the hole out for it (and hot glued it into place). I remove the plastic touchpad skin and cut a square piece of touchpad skin from an old bamboo tablet and used it in its place to give it a clean and slim look. Since I had so many problems trying to reuse the old keyboard, I decided to completely replace it with a Leopold FC660M Mechanical keyboard Cherry MX Blue switches W/Gray body. Now, if you are good with using Teensy and programs keyboards and their matrix's, then you can reuse the old keyboard. However, I spent way too long trying to get it to work right. So, I made a custom housing for the new keyboard and it fits in perfect. In addition, I soldered two prongs on to the back of the keyboard wear the CAPS lock light is located so that I could run an LED light into the screen housing to indicate when the CAPS is on. There are a few more additional parts you might want to add. Such as the LCD Digital Thermometer and a 300Mbps 11n Wireless WiFi USB Adapter. In addition, study the pictures here to see where I placed all the wires, power supplies, etc. Now, all you have to do is reassemble the case. Make sure all the wires are in the right place, make sure the heatsink and RAM fit right. And just so you know, it is going to be a very tight fit and will take a few minutes to get everything lined up right and screwed in together. I also had some more fun and gave it a name: VeraTwo. I made a special logo for it and had metallic die cut stickers produced for the outside housing and also reprogrammed the BIOS to display the VeraTwo logo instead of the motherboards (Foxconn) logo. That is in fact a nice modern computer, portable enough, powerful enough, good feel... costs a copious amount of money but still nice. Still I can't help but feel depressed for the glorious plasma screen being thrown out, it being so rare; mine just gave up the ghost. Well it's also too bad if the motherboard got thrown out. Do you still have the previous keycap set (or even the keyboard?) i might be interrested to play with it. You have done an amazing work here sir!! :D i have one question. where did you put the touchpad? is the black square above de keyboard in the middle? GRAMMAR NAZI HERE! You missed an A and an S in "reassemble". 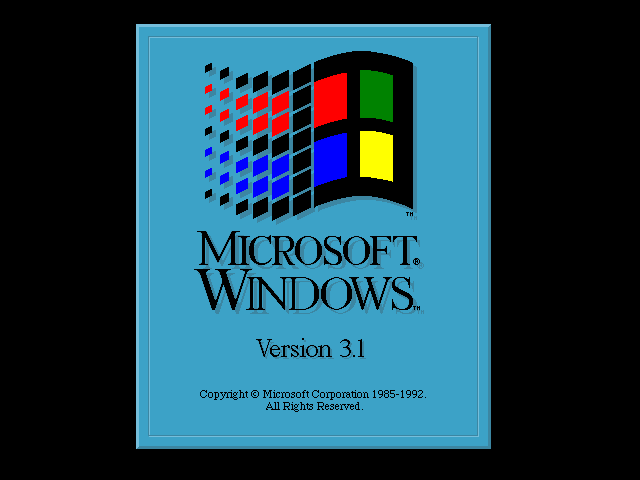 Unless that was a joke about resembling the old compy to look like the new one. Can you explain in a little more detail how you reprogrammed the bios to display the new logo? I have searched and searched for how to do this and I am not coming up with anything. My motherboard actually came with software that allowed you to easily change your bios start up image. But you can also do it this way as well. Here is a PNG of the old splash screen, http://www.techgremlin.com/wp-content/uploads/2008... if you open that in IE you can right click the image and set as desktop background. Shayne it would appear that he is just using that windows 3.1 splash screen as the desktop background, as the task bar is along the bottom. Thanks! Took a lot of trial and error. Cost a little over $1000 for this build.